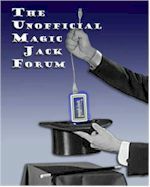 We want to apologize for the downtime magicJack Unofficial Support had over the weekend our webhost failed on us. Sunday we were able to change hosts and get the site up and running. For some of you who get redirected from the old host while the DNS updates, you will be able to read all the forum but not post. This should rectify itself within a day or two as you are pointed to the right domain. We are very glad to be rid of our old host as they have had many problems, too much downtime and their support is terrible. Good to know, admin. Thanks for keeping on top of things. I was wondering how Jumpline was as a provider and I guess that answers my question. Hope the transition went well. Looks good here. Absolute crap webhost, others have had 4 days of downtime. I like the phone that shows on my Chrome browser on the tab when I come in here and on my bookmark now. Gives one that warm feeling. It has posted if I go back into the forum. Is this on my end, or something with the new system? You know, I thought that smtp.php might be Egyptian haha.gotcha. Can you let us know if it is still happening, thanks!